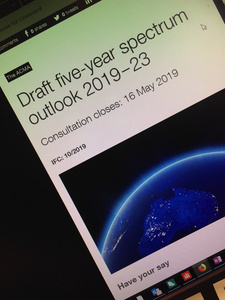 The Australian Communications and Media Authority (ACMA) has released a consultation draft of its Five-year Spectrum Outlook for 2019–23, which sets out the work that it plans to do in spectrum management over the next few years. During the next year or so, the ACMA intends to work on progressing access to the long-awaited 60m band, reform of the Amateur licence conditions and furthering availability of amateur qualifications. The WIA will be making submissions and working with the ACMA to progress amateur radio matters. Of particular interest – at the top of many amateurs’ wish lists – is work to progress access to the 60m band at 5.3 MHz, allocated world-wide to licensed amateurs at the 2015 World Radio Conference (WRC-15). The ACMA notes that the band is included in the Australian Radiofrequency Spectrum Plan (ARSP), but there is opposition to the allocation from Defence, due to potential interference. However, the ACMA intends to publish a discussion paper in the third quarter of 2019-2020 seeking views on implementation issues. On the subject of Licensing and Licensing Systems, the ACMA intends, over 2019-2020, to seek the inclusion of amateur qualifications in the Australian Qualifications Framework to enable more education and training bodies to provide amateur training and qualifications. Public consultation will be a key component of the Authority’s work. Of direct interest to all amateurs and prospective amateurs is the ACMA’s intention to commence consultation on potential changes to licence conditions in the fourth quarter of 2018-2019 – coming up real soon, now, and perhaps further consultation in the first quarter of 2019-2020.